So you think you know Winnie-the-Pooh, and Tigger too? Here are ten facts you probably don't know about the real Christopher Robin, his father A. A. Milne and Pooh himself. Disney will release new feature film Christopher Robin, with Ewan McGregor in the title role in 2018. So you think you know Winnie-the-Pooh, and Tigger too? Find out ten facts you probably don't know about the real Christopher Robin, his father A. A. Milne and Pooh. Watch the first trailer of new Disney feature film Christopher Robin— which stars Ewan McGregor, Peter Capaldi and Hayley Atwell— below. The two men lived a few streets away from each other when growing up in Kilburn, both fought at the Somme, and had numerous friends in common, but they only met many years later when they both working for the magazine Punch. I had decided on two initials rather than one or none because I wanted him to play cricket for England, like W.G. Grace and C.B Fry ... A father has to think of these things. ‘Alice’ was Christopher Robin’s nurse, Olive Rand, affectionately called Nou, but Milne used the name Alice as it rhymed with Palace! Nou is played by Kelly Macdonald in Goodbye Christopher Robin. He was known in his family as Billy Moon, as ‘Moon’ was how he would pronounce 'Milne' as a boy! Even though Christopher Robin's real toy bear, an Alpha Farnell bear from Harrods, was named Pooh, he was not the basis of the illustrations. E. H Shepard’s son, Graham, had a Growler that he called "a magnificent bear". Shepard claimed that this Growler was the true visual inspiration for the iconic drawing. Oh bother! Although there are many different stories about where the name came from, we certainly like this one the best! Named after Winnipeg, Winnie the bear was was one of the most popular animals at London Zoo in the 1920’s. Like his father, Christopher Robin wrote a number of books, including The Enchanted Places, about the real setting of the Hundred Acre Wood, Cotchford Farm by Ashdown Forest. You can still visit some of the locations that inspired the stories including Poohsticks Bridge. At the age of fifty-four Christopher Milne recalled his early childhood, remembering 'the enchanted places' where he used to play in Sussex. The Hundred Acre Wood, Galleon's Lap and Poohsticks Bridge existed not only in the stories and poems but were part of the real world surrounding the Milne home at Cotchford Farm. These facts are taken from the book that inspired the film, Goodbye Christopher Robin by Ann Thwaite. 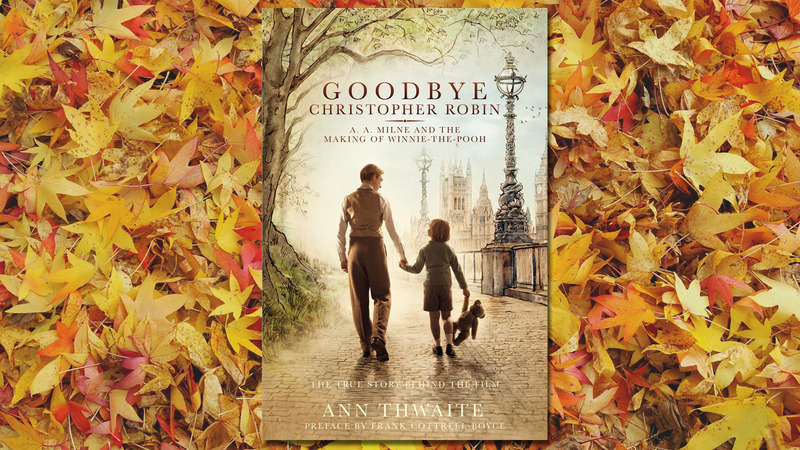 Goodbye Christopher Robin is in cinemas from the 29th of September 2017, and the charming biography it's based on is out now in paperback and as an ebook. This new edition of the acclaimed biography by Ann Thwaite includes a preface by screenwriter and children's author, Frank Cottrell-Boyce. T-T-F-N: Ta ta for now! To find out even more about the story and history of the 'Silly Old Bear', visit the new V&A exhibition Winnie-the-Pooh: Exploring a Classic, which runs until 8th April 2018.